While it's simple for us to work out when a new user accesses your SuiteFiles site and add the to your subscription we don't know when someone has left. Inactivity on the site may be an indicator but someone could be on holiday or extended leave for some reason and you don't want them removed. The user is then deleted from your list. This is registered in the View Activity tab. The user will be a part of the user count for the month in which they were removed (e.g. if the user is removed in May 2016 they will appear on the May 2016 subscription) and will not be counted from the month following. NOTE: This only removes the user from your SuiteFiles subscription but doesn't stop their access to SuiteFiles, if you need to remove their access and don't want them to be able to login then you'll either need to reset their password in Office 365 or delete their Office 365 user account. 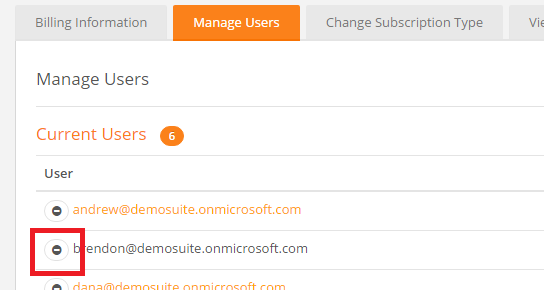 Please note that users who are removed in the management portal will still be listed as users in your SuiteFiles groups. This is for historical information and allows the information of file last modified by to still have old users names. You can't remove them in SuiteFiles.